Australia is a lucky country, but we are also a competitor in the global economy. Obviously, our goods and services compete against those produced in other countries. But we also compete for global capital looking for a nation to invest in. What Australia produces, and how much we produce it for, are both factors in how successful we will be as a country in the global marketplace. Survey respondents this year identified cost competitiveness as one of the top three policy issues for resolution in Australia next year. Cost competitiveness is a relative issue. That is, costs are important relative to the same cost in competitor countries, but also costs are important relative to the value of output produced, both here and overseas. 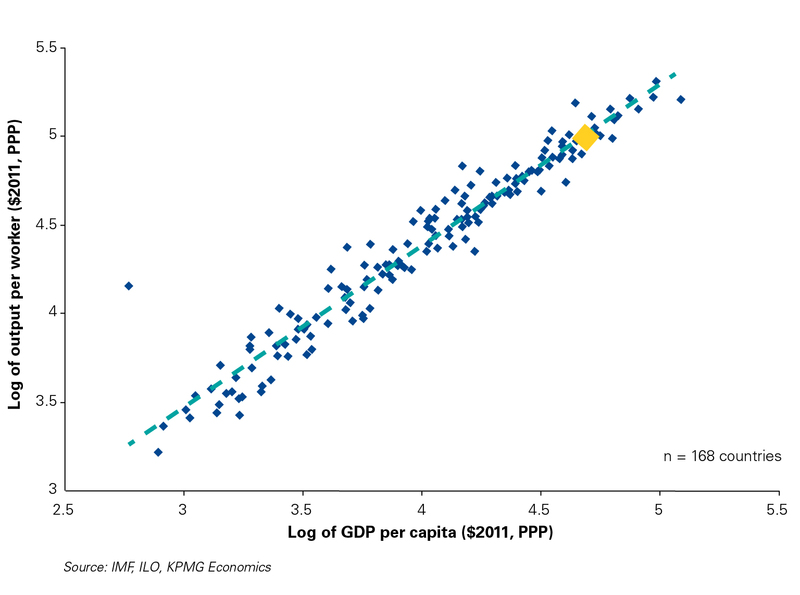 Chart 1 shows the relationship between GDP per capita, which is a measure of living standards, and output per worker employed, which is a measure of labour productivity. The yellow dot on the chart represents Australia, with blue dots representing the remaining 167 countries in the sample, and the dotted line showing the trend relationship between the two variables. This analysis shows Australia is sitting slightly below the trend line, which means for our given level of GDP per capita, our output per worker is less than it should be if we were to have average competitiveness. KPMG Economics has calculated this shortfall in 2015 to be about 7 percent, substantially better than 2010, where Australia’s shortfall was nearly 16 percent. Nevertheless, this analysis shows Australia underperforming from a productive output perspective compared to countries with similar standards of living. This would suggest the concerns regarding labour cost competitiveness raised by our survey respondents are, at first blush, justified. We have also looked at the total hourly compensation costs in the manufacturing sector for 21 countries, and considered these costs in the context of gross value added (GVA) per hour worked. Unfortunately, this analysis (Chart 2) further reinforces the poor labour cost competitiveness story for Australia. Chart 2 shows the relationship between labour cost per hour and GVA per hour for the manufacturing industry in 21 countries, with the yellow dot again representing Australia. In this analysis, Australia is much further below the trend line compared to the whole-of-economy analysis. This below-trend outcome for Australia indicates the hourly cost of labour is too high relative to the final value achieved for the manufacturing output produced (again relative to the countries considered in the dataset). 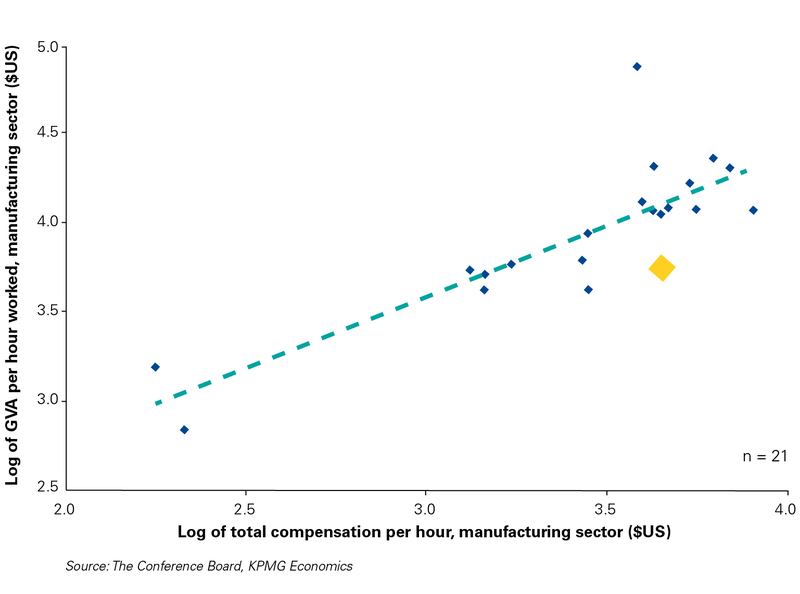 The differential between what compensation rates should be for the manufacturing sector and what compensation rates are is significantly more pronounced than in the whole-of-economy analysis. This, albeit limited, analysis suggests manufacturing compensation rates in Australia were about 32 percent and 43 percent higher than they ‘should’ be in 2010 and 2015 respectively. This means, over the relevant five-year period, the compensation costs grew faster than value added, meaning profitability for the manufacturing sector in Australia experienced a squeeze. While labour costs can represent between 40 percent and 57 percent of the cost base for a manufacturing business, the cost of utilities, including electricity, gas and water, can also be important. 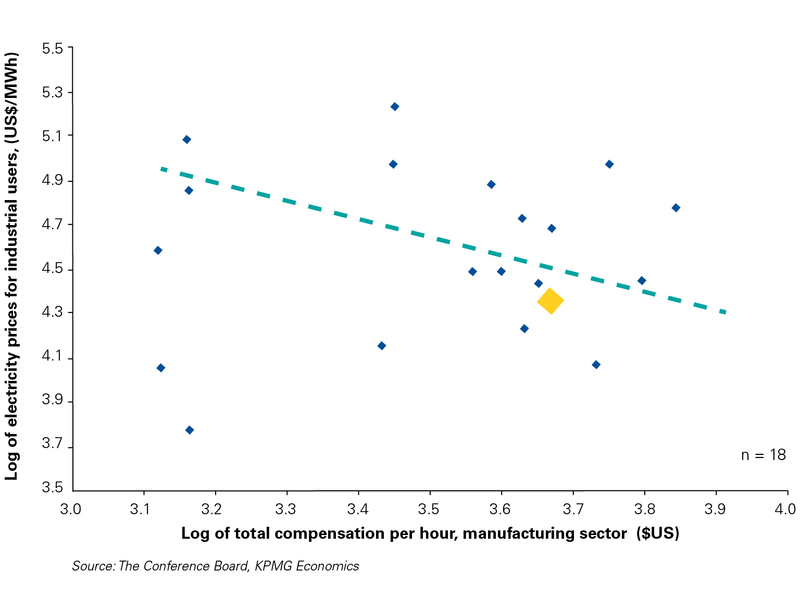 Chart 3 shows the combination of total compensation costs per hour in the manufacturing sector and the price of electricity for industrial users for a range of countries, including Australia (highlighted as the yellow dot). This analysis shows that while Australia had a relatively high cost of labour in 2015, it had a below average cost of electricity for industrial users. Unfortunately, this favourable cost-competitive position for Australia has been eroded over the past two years as the domestic prices of electricity and gas have soared. 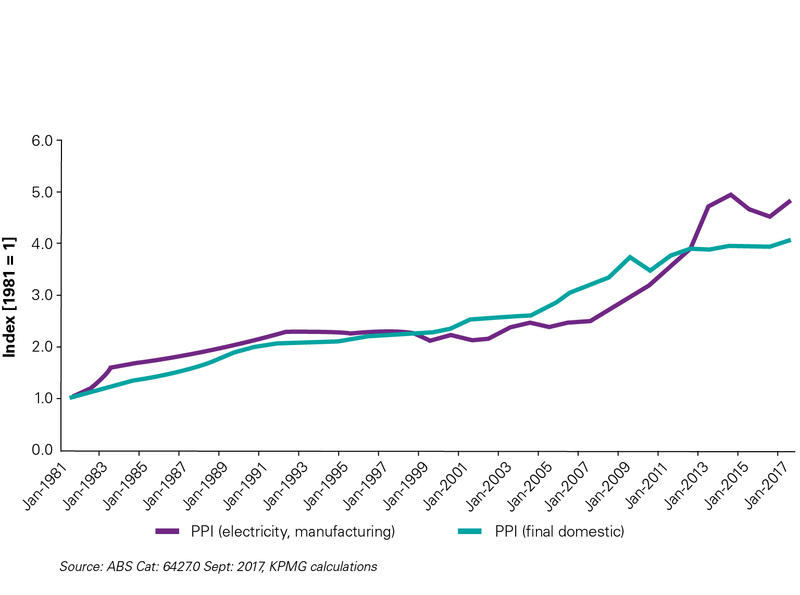 As shown in Chart 4, the price index of electricity for manufacturing sector in Australia has kicked up since 2015. The latest State of the Energy Market Report released by the Australian Energy Regulator (AER) in May 2017, finds that during 2015-16 wholesale electricity prices rose by between 50 percent and 67 percent in almost every state and territory covered by the National Electricity Market (NEM). Disturbingly, the AER study also reveals that the upward trajectory of the wholesale electricity prices was maintained into 2016-17, with the largest rises being experienced in South Australia, Queensland and New South Wales. limitations of electricity imports into South Australia due to interconnector maintenance. Chart 5 confirms our earlier comment regarding a profit squeeze in Australian manufacturing identified in the international data. 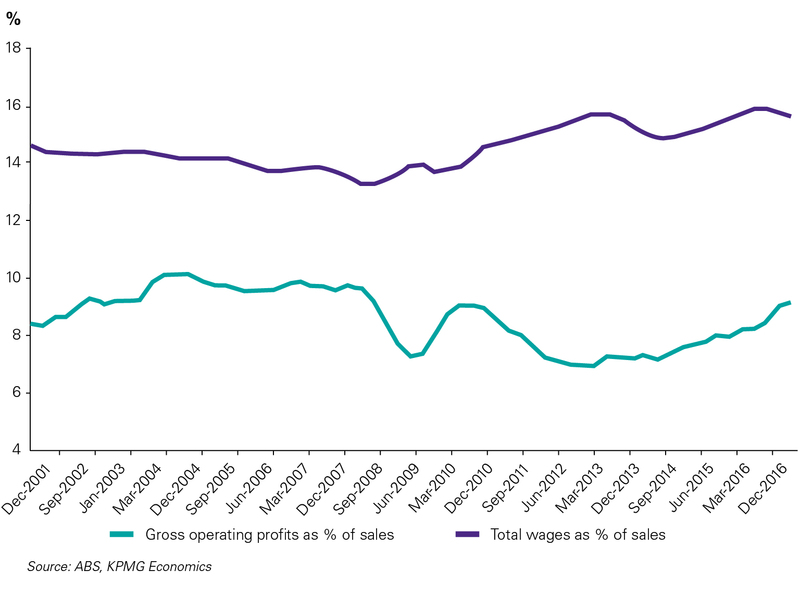 Between the December quarters of 2010 and 2015, gross operating profits as a percentage of sales moved down from 9.1 percent to 8.0 percent, while total wages moved up from 14.2 percent to 15.5 percent. Clearly, over the five years to 2015, returns to workers increased, costs of electricity to industry escalated dramatically, while returns to shareholders declined. However, it would seem from more recent data that wages growth, particularly within the private sector, has been weaker over the past year or so than it has been in more than half a century. Australia is a small, open economy. It competes for equity capital seeking industries and countries in which risk can be adequately compensated. The divergence between returns to shareholders and labour has long been a problem for Australian manufacturing. 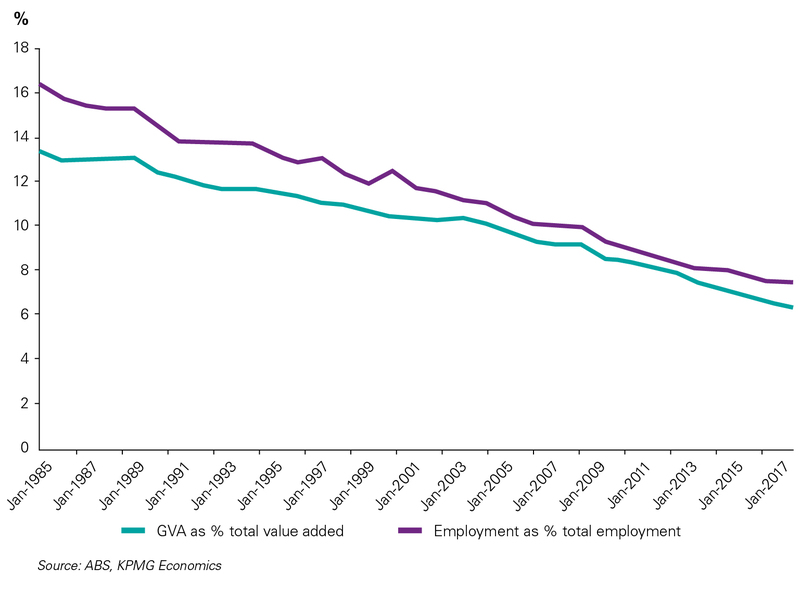 This has been one of the key contributing factors to the sector’s relative decline in importance over the past three decades. 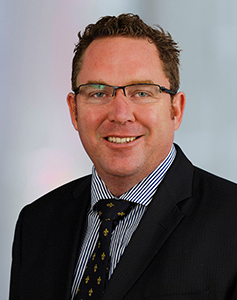 In a speech in November 2017, the Governor of the Reserve Bank suggested the sluggish wages occurring across the economy were likely to be a consequence of businesses not bidding up wages, as they have done historically, owing to increased competition. This is unsurprising given ongoing excess capacity in the labour market. Despite recent increases in full-time employment, the unemployment rate is still around 5.5 percent, and underemployment is at historically high levels. A nation’s cost competitiveness relates to more than just its direct costs. 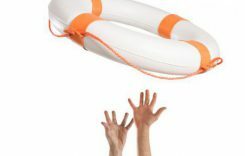 Rational shareholders seek to maximise their risk-adjusted, post-tax return on equity. This means that while the underlying market conditions are most important from an investor’s perspective, tax still matters, albeit at the margin. Sometimes, however, the margin can be wider than governments think it is, so tax begins to matter even more. Disadvantages in cost competitiveness can be ameliorated through a country’s corporate tax system if it is more competitive than in other jurisdictions. Unfortunately, our survey respondents suggested that instead of helping, Australia’s corporate tax system actually acts as a further impost on the ability to earn internationally competitive returns. The Tax Foundation’s International Tax Competitiveness Index places Australia in seventh place overall in comparison to 35 countries surveyed. However, Australia is ranked 25th on the basis of its corporate tax system. It would seem then that our survey respondents have a point. Australia’s cost competitiveness is below where it should be on the basis of labour costs and productivity. Our relatively low electricity cost environment has evaporated in the past two years. And our corporate tax system is globally uncompetitive and unsupportive. All the negative factors weighing on Australia’s corporate landscape are fixable. But to do that, the Australian Parliament needs to implement a strong reform agenda. At present, a comprehensive reform agenda is missing, and unless it emerges in 2018 our luck may soon start running out.